Santa isn’t the only one “making a list and checking it twice.” The Hillsborough County Sheriff’s Office (HCSO) District IV Deputies do just that as part of their Deputies Darlin’s project. Every Christmas since 1980, these deputies have become Santa’s helpers, delivering donated gifts to needy families they have met during the year. They are given discreetly to the parents who can then decide what to tell the kids about where they came from. 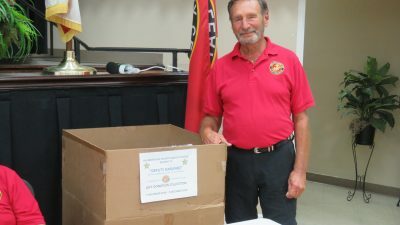 The Leathernecks (Marines) are one of several groups supporting Deputies Darlin’s with Allan Klein leading the drive. “It appeals to me because the gifts can come from the parents,” he said. Here, he mans the collection box at the Hi Neighbor! earlier this month. Deputies Darlin’s is a South Hillsborough County program (primarily Sun City Center, Ruskin, Riverview and Apollo Beach). The nonprofit organization works this way. Unwrapped gifts are picked up by the deputies from specified locations and delivered to a central sorting and wrapping station. There, gifts are matched to children on lists submitted by the deputies. This year, they need to receive all the gifts by Dec. 17 to be delivered to homes on Dec. 22. Drop-off points in Sun City Center are the SCC Area Chamber of Commerce, Club Renaissance, Kings Point North Club, Dunkin’ Donuts and the HCSO SCC Community Station on the Central Campus at 948 Cherry Hills Drive. Monetary donations are welcome as well to shop for specific children where there is a shortfall. (Teenager gifts are usually sparse.) In surrounding communities, the gifts can be dropped off at the respective substations. In some instances, the gifts will be picked up. 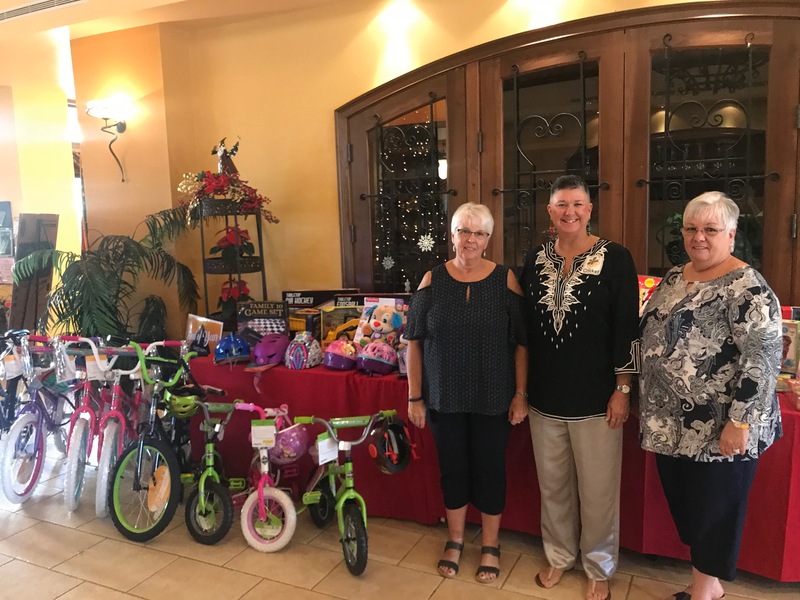 For example, the Sun City Center Aquasizers need a pick-up because each of the 100 or so members expected to attend the club’s Christmas dinner will be bringing a donation. That’s a lot of gifts. “Last year, we filled a whole van,” said Jeff Merry, community resource deputy who, with Deputy Rob Howard, play a major role in the group’s operation. If a pick-up is needed, call Michelle in the SCC Community Station at 813-242-5515. Aquasizers directors Pam Zion, Cricket Fraser and Michele Rittberg are pleased with the support of Deputies Darlin’s by their fellow club members. How Deputies Darlin’s began in 1980 is a heartwarming story. As a community service officer in the Ruskin office and later in Sun City Center, Donna Castillo-Budd learned about needy families the deputies met through calls and cases. Early on, they tugged at her heartstrings personally since she was a single mother with three young children. Even now, after retirement five years ago, she continues to be involved, working alongside her son-in-law (Deputy Robert Howard) and daughter Traci to sort, wrap and determine who gets what. “It’s a family affair for me now,” she said. “It’s all about the kids, and I am blessed to have my family continue in the program.” Budd said that in addition to the joy they bring to children, she sees a side benefit of Deputies Darlin’s. For the older kids, it teaches them to respect the deputies since they see them as participants in a good situation — not an unhappy one. For questions about the program, email Deputy Robert Howard at rhoward@hcso.tampa.fl.us or call the Hillsborough County Sheriff’s Office District IV Community Station at 813-242-5515.